Get creative with these animal finger puppets! This set includes 5 crochet patterns: bear, bunny rabbit, cat, dog, and elephant. The animal finger puppets make fun toys for a child or even an adult. Some embroidery skills required to create the faces. Download this pattern at the Crochet Spot Store. By purchasing this pattern, you will be supporting Crochet Spot. Thanks in advance for all of your support! 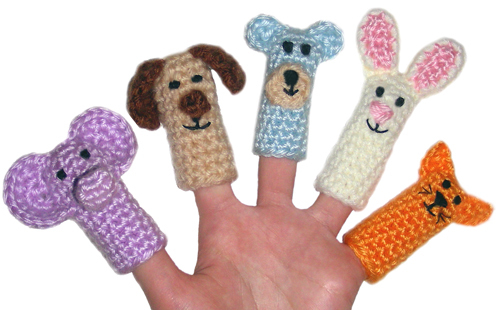 Need help crocheting your finger puppets? Let me know as I’m always willing to help! This entry was posted on Thursday, December 17th, 2009 at 7:02 PM by Rachel Choi	and is filed under Best Crochet Patterns. You can follow any responses to this entry through the RSS 2.0 feed. You can leave a response, or trackback from your own site. These are so Cute! How do you do the eyes?? I just got done crocheting Mary for my nativity scene and I can’t make the eyes look right. Hi Lane, the eyes are embroidered. I use a need and thread and just go in and out until it gets full and starts to look like an eye. They are so cute and so simple. I looked on the internet for other finger puppet patterns, but they all look so complicated. These are adorable, I have knit some when my daughter was little, but I will have to try these.